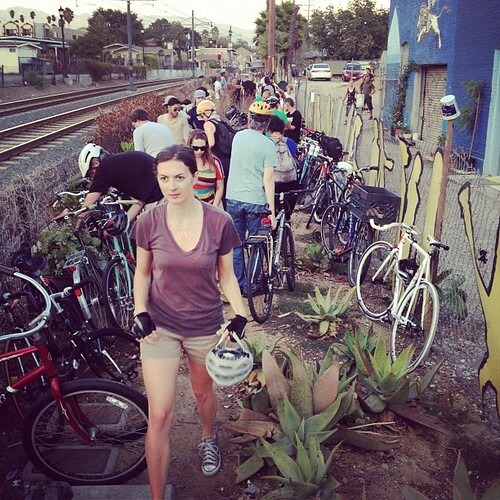 Join us this month on another Spoke(n) Art bike ride on Saturday, June 8, 2013 at 6 p.m. at the Flying Pigeon LA bike shop. Meet at the Flying Pigeon LA bike shop at 6 p.m., the ride will ride out to the first stop of the night at 6:45 p.m. (there is a street festival happening in front of the shop at 6 p.m.) The ride will return to the Bike Oven (3 blocks away from the Flying Pigeon) at 10:30 p.m. or thereabouts for an afterparty. The ride is a slow-paced cruise, stopping every couple of minutes. Sometimes we veer off the beaten path, sometimes a backyard party – it all changes slightly from month to month. At the end of the ride, we will return to the Bike Oven at 10:30 p.m. for an after-party and a show by the band Washing Machines. Don’t have a bike? No problem! Flying Pigeon LA rent single speed beach cruisers with blinkie lights for $20. We have a fleet of bikes – just make sure to show up at or before 6 p.m. to ensure you get a bike! Things get hectic at start time, with over 100 riders congregating at the shop before we leave.